It’s not often that cheese and port appear in an online slot but both make the cut in The Finer Reels of Life, a 5 reel, 243 ways to win video slot from Microgaming. This luxury themed game comes with plenty of opulent treats including double wild payouts, random wild reels and a selection of free spin features with multipliers, added wilds and rolling reels. Play from between 30p and £7.50 per spin. The imagery in The Finer Reels of Life has a luxuriant feel – imagine a weekend away at a 5-star hotel. Set against a deep purple backdrop, the reels include gold playing card values as well as chocolates, cups of coffee, cheese and port, whisky and cigars, bottles of champagne and diamonds. 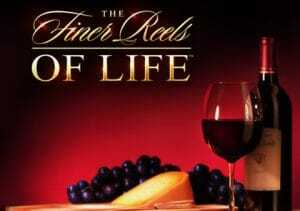 The Finer Reels of Life logo is the wild – when it forms part of a winning combination, that payout will be doubled. There are plenty of goodies that come all-inclusive in this luxurious looking game – the Wild Celebration feature is triggered at random and can turn up to 5 reels totally wild! Coffee and Chocolate feature – here you’re awarded 10 free spins with a 5x multiplier. You can retrigger the feature giving you 20 free spins in total. Wine and Cheese feature – this becomes unlocked from the 5th time you’ve triggered the feature. 15 free spins are awarded. Look out for the Wild Wine symbol – when it lands on reel 3, it can transform up to 15 symbols into wilds. You can add to your tally of free spins whenever a bonus symbol lands with up to 4 extra available. Whisky and Cigars feature – you have to have triggered the feature 10 times to unlock this one. You’ll be given 20 free spins. Following any successful spin, the Burning Wilds feature is activated where random symbols are transformed into wild 2x or 3x multipliers. If 2 symbols burn, the multipliers combine up to 6x. Champagne and Diamonds feature – this opens after 15 triggers of the feature. An initial 25 free spins are awarded, this time with Rolling Reels in play. After a winning spin, the successful symbols are blasted away and replaced by the symbols above. These keep on coming as long as a new winning combo is created. A dynamic multiplier increases with each Rolling Reel win starting at 2x and going up to 5x. As you’d expect given its name, The Finer Reels of Life is a classy affair, both in terms of visuals and features – the laid back soundtrack may give the impression that this is a chilled out video slot. It can still hit pretty hard on the payout front though. We found the variance to be on the high side of medium. If you’re looking for a slot that oozes sophistication, then The Finer Reels of Life should suit you nicely. Get lucky with the bonuses and some 5 star rewards are on offer too. If you like the nicer things in life, I also recommend NetEnt’s Mega Fortune which has delivered many life-changing, multi-million pound jackpots.